I’m still not sure if I’ve seen a black vulture. I may have seen them in the sky. Now that I know a little more about how to identify them, I’m going to have to look more closely. In the end, I didn’t have to look closely at all. Only a week later, while hunting for berry-laden possumhaw, I glanced into the tangled thicket of trees and shrubs edging a canal, and there they were. Some distance from the road and obviously comfortable on their limb, they seemed undisturbed by my presence as I left the car to watch them. I felt at the time I was watching a mated pair, and now that I’ve learned the species forms monogamous, long-term bonds, I’m even more certain of it. Perhaps because of her urging, that’s exactly what he did. When I left, the relaxed pair looked as if they might be settled in for a nap. An hour later, I found them still on their limb: apparently well-fed and happy. Only children keep their eyes open… Matt Spireng has collected thousands of arrowheads and spearheads; he says that if you really want to find arrowheads, you must walk with a child–a child will pick up everything. All my adult life I have wished to see the cemented case of a caddisfly larva. It took Sally Moore, the young daughter of friends, to find one on the pebbled bottom of a shallow stream on whose bank we sat side by side. “What’s this?” she asked. That, I wanted to say as I recognized the prize she held, is a memento mori for people who read too much. Ah, nice set of photos and those two look quite content. Isn’t it amazing what you see when you look? I’m sure that my garden has always hosted the birds (especially the winter Texans) that I enjoy observing–but didn’t–until these past couple of years. There they are, living their lives–and we can watch, observe, learn and enjoy! “Content” is exactly the word. It was a lovely, warmish day, and they clearly were taking advantage of it. Even though they were in plain sight, I do wonder if I would have seen them without my recent post about the turkey vultures. How we learn to see — or don’t — is a mysterious process. One helpful tool I’ve found is the Merlin Bird ID App from Cornell. I tested it out by seeking IDs for birds I already know, and it was right every time. The same day I saw these vultures, a small, flitty bird I saw turned out to be a blue-gray gnatcatcher. I’d never seen one of those, either. Well, I’m kind of going out on a limb saying this, these birds are almost handsome. As vultures go, anyway. And they do look very companionable. Great shots. The head-scratching one, reminded me of a relative, a bit hard of hearing in one ear, who sometimes seems to have trouble hearing his wife, when it’s convenient. I’ll join you on that limb. I think they’re handsome, too. I suspect someone who didn’t know they were vultures, and didn’t know anything about their dining preferences, would make the same judgment. The gray head goes so nicely with those black feathers, and when they’re in flight, there are white patches on the underside of their wings that makes it look a bit like they’re wearing gloves. Think an avian version of Fred Astaire. Isn’t that the way? They are rather marvelous looking. Now that you see them, how are they different from turkey vultures in flight? Turkey vultures hold their wings upward, in a V shape, and tend to wobble back and forth a bit as they’re soaring. 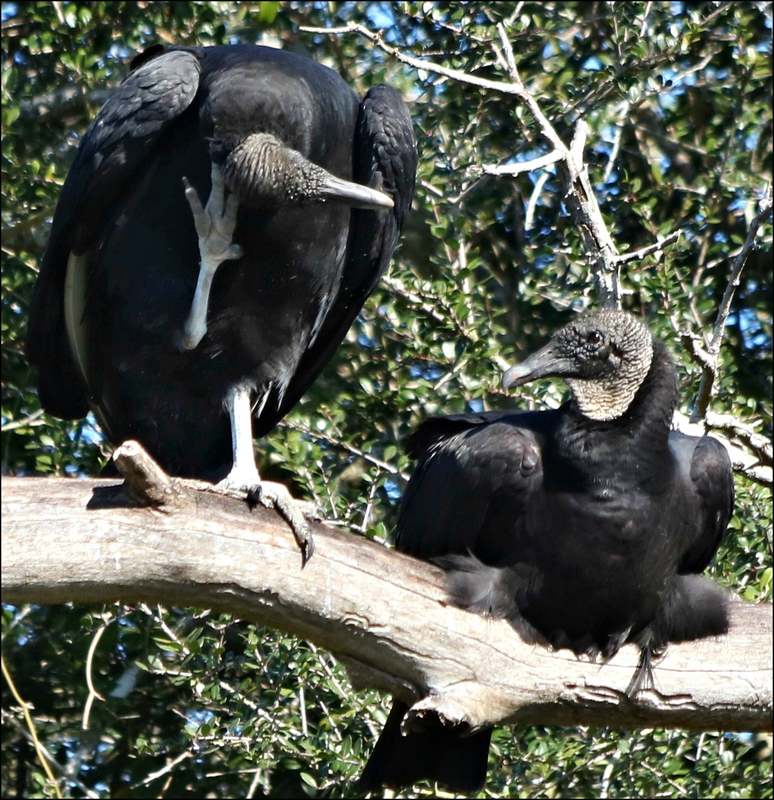 The black vultures are stronger flyers, and hold their wings level as they soar. Also, turkey vultures have a lot of white on the underside of their wings, while black vultures only have a white patch at the wingtips. If they’re low enough to get a good look at the underside of the wings, identification is easy. I’d hoped to catch these taking off from their tree, but they weren’t in any mood to fly; they were too comfortable. The species name atratus is Latin for ‘clothed in black for mourning, dressed in mourning.’ Oh, those poetic biologists. It hadn’t occurred to me to associate death and mourning with these birds, despite their color. I thought more in terms of a black tux and a little black dress. It’s interesting that even the Cornell site refers to them as “almost dapper” and “highly social.” Maybe this pair was ready for a night on the town. Have you seen them fly? That’s the only way I can identify them for sure — by the interesting shape of their wings. Eons ago we won a road trip with a naturalist to go raptor spotting. We saw quite a few interesting raptors but that was the one thing I learned and retained — check the wing shape if you see one flying! I have seen them fly, Jeanie. We seem to have mostly turkey vultures here in town, but I’m sure I’ll see more black vultures on the wing now that I know what to look for: a shorter tail, white wing tips, and wings held straight, rather than in a V like the turkey vultures. I was glad to get a good photo of the feet. Since they don’t capture live prey, like a hawk, they have shorter, weaker talons, and more padding. One of the birding sites mentioned that their feet are designed to clean up nicely after they dine, since they spead a good bit of time standing in the middle of their meal! “The more we see, the more we see.” So true! Too often, our thoughts and attention are elsewhere, camouflaging what’s right around us. These black vultures are, as you said, well fed. Do you know if they put on additional feathers over the winter months (much as a dog’s fur thickens), or has it just been a good “hunting” season down there?? I think they might be fluffed up a bit, because of the cold. I don’t think birds put on additional feathers in winter — but I don’t know. I’ve never thought about it. That’s an interesting question, and worth exploring. 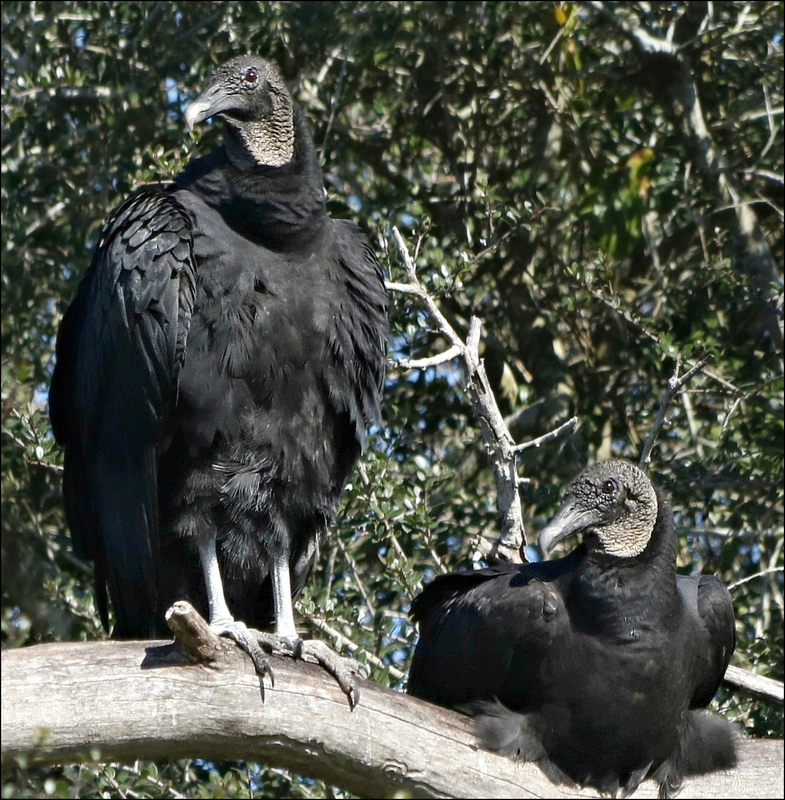 I did read that adult black vultures in Texas weigh about four pounds, give or take. I would have guessed these were heavier than that, but it may be the “fluffed feather effect” kicking in that makes them look so substantial. I had never seen a black vulture before. Those big birds are awesome! You’re right on both counts, Terry. They are big, and they are awesome. I think the gray and black combination is especially attractive, and their wrinkly heads are amusing. I learned that they not only form strong pair bonds, they stay together after the young have hatched, and will continue feeding them for up to eight months. I haven’t found any information yet on why that is, but I suspect it has to do with the need to teach the youngsters how to scavange on their own. Finely velveteen as any royal pair on their thrones. Gorgeous pictures – going for any TPWL mag submissions? Thanks for the good word on the photos, Phil. Realistically, they aren’t magazine quality. The focus isn’t sharp enough, for one thing. The real problem is that my lens didn’t have enough reach to get good closeups, so I had to do some significant cropping — leaving an image too small for print. Maybe next time. A royal pair on their thrones is a great description. That’s exactly how they seemed: dignified, and just vaguely regal. First thing I thought of was Snoopy sitting in a tree playing vulture in the old Peanuts cartoon strip. Second thing I thought of was how much road kill we saw on and beside the roads going to Llano, including several deer. Our friend was saying they always try to be back to the cabin before dark because of the very increased chance of hitting a deer after dusk. When the road kill is actually in the roadway, there is a greatly increased chance that vultures attempting to do their job could be taken out by cars blazing down the road at 70 mph or more. Doesn’t do the car any good and does the vulture no good at all. How could I have forgotten about Snoopy playing vulture? There were some wonderful story lines in that on-going saga. Today, people seem to focus on Charlie Brown’s Christmas, which is fine, but there’s a lot more to enjoy. It’s wise to be cautious about deer at dusk and dawn both: feral hogs, too. I’ve never come close to hitting a deer, but I’ve had to hit the brakes now and then. The best and truest advice I ever was given was, “If a deer crosses in front of you, wait for the rest of them.” I’ve not spent enough time in the Panhandle to judge, but when I have traveled through there, I never saw roadkill. Interesting. Watching the turkey vultures deal with the occasional squirrel or raccoon around here can be amusing. It’s not easy, trying to dine in the middle of traffic. But they’re agile, and get the job done. One doesn’t see a lot of road kill in the panhandle for two reasons: Lack of cover — nothing but bare fields subject to intermittent traffic from large farm equipment and, — apart from weekends on the TTU campus — not a lot of wildlife either. Of course that would be true. My memories of driving through are of cotton fields, rangeland, one jackrabbit, and a couple of flocks of sandhill cranes. I chased those cranes for a good while, and finally gave up. It would be more profitable to come up and visit someplace like Buffalo Lake wildlife refuge. Growing up I remember only seeing turkey vultures. 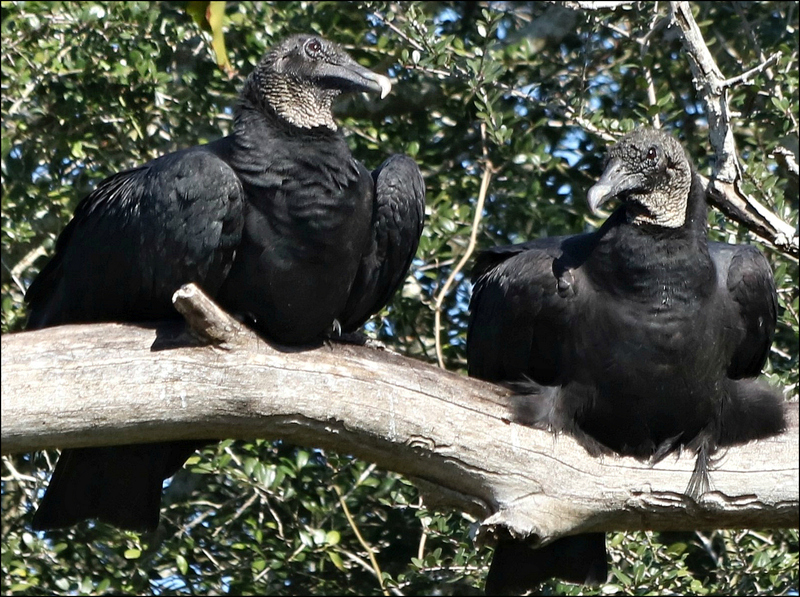 In the last three, four decades though the black vultures have almost supplanted them. I can’t remember the last turkey vulture I’ve spotted. That’s really interesting. Over here, turkey vultures are common as can be. Almost every day I’ll see at least one or two, or even a group of them soaring. I wonder if it’s an urban/rural thing? Maybe our heavier traffic means more roadkill, or perhaps you have more of the habitat that black vultures prefer. It’s amazing how much difference fifty miles can make. These birds are whole lot better looking than the turkey vultures!!! I have to agree, GP. I don’t have a thing against the turkey vultures, but they’re just not as attractive as the black vultures, which are more compact, and have tidier feathers. On the other hand, the black vulture doesn’t have that keen sense of smell, so it often depends on the turkey vulture to find the next meal. That’s certainly worth something! You really caught good photos of them. It is so exciting when you find something you haven’t identified before isn’t it? I think I mentioned that we see them occasionally when driving over the Dumbarton bridge to Palo Alto. I always thought they were drying their wings, but apparently they are just airing them out. Nature’s garbage men. It is exciting, Kayti. I found a wildflower blooming last weekend that I still haven’t identified; doing so is one of my weekend projects. Your mention of the bridge reminds me that I often see turkey vultures perched atop the light poles on the approaches to one of our bridges. The combination of marshland at the base of the bridge and heavy traffic is a good combination for them — though not so good for the creatures that decide to cross to the other side of the road. The grasses might be greener, but getting there can be a little iffy. Great birds and I am drawn to comparing them to Funeral Directors or Court judges. There is wisdom in their eyes and postures. A kind of self assuredness that seems to indicate they know their position in life. I bet they wake up and make the best of the day. I agree completely with – the more you see, the more you see (in Nature). Once my eyes have tuned in to a particular bird movement or colour, I seem to see them everywhere. I think that’s something some of us have a gift for too. I find that residential areas can be rather mundane, but put a camera in front of your eye and zoom in to the small details (erasing the surrounds) and a whole new world opens up. The same is true with sounds. I went for years not knowing what an alligator sounded like. Now, when I hear that grunt, or that splash, I know it’s time to back up and take a second look at the surrounding territory. As you well know, the can be the sound of a bird that signals its presence, long before we actually see it. I didn’t realize for a while that “bird watchers” had become “birders,” but that’s one of the reasons. The watching’s only part of it; listening is just as important. Great photos. My you are so lucky Linda to “stumble upon” all these interesting subjects. These are excellent close ups of the black vulture. They really do look like a mated pair and the bird on our right is giving her or his mate a look of disdain as he or she scratches its head. The photo made me laugh. That photo made me laugh, too. I’ve heard some people say that anthropomorphizing birds (or animals, or plants) is wrong, but I think it’s one way we begin establishing a connection with the natural world. If it’s acceptable for children’s books, why shouldn’t it be just fine for adults? All it takes to understand the power of the bonds between birds is seeing a pair that’s been separated. A couple of years ago, a mallard pair lived in one of the marinas where I work. They lived for months on the same pier, and then one day she was gone. The male spent two months doing nothing but swimming around the marina, quacking forlornly. When he wasn’t doing that, he’d stand on “their” pier, quacking his heart out. Who knows where she’d run off to, but eventually she came back. Now, they’re still on that pier. Apparently all has been forgiven. I’ve never seen a caddisfly larva, but I have seen the wonderful lacewing larva, that covers itself with debris as camouflage. As for caddisfly larvae, have I got a project for you! The Everglades is one place I’d love to visit. I suspect you could provide more than one photo essay from your visit(s) there — including the vultures! What fun, Linda. That is some artist! I’ve seen caddisfly larva put together all kinds of cases. And they are always fun. It took great imagination to have them create jewelry, however. Now I want to find a caddisfly larva case. I’ll have to spend more time around streams and ponds. I love that the artist gave equal billing to the caddisflies, calling them partners in his work — as they are. I don’t remember when it happened, but at some point I realized there was another species of vulture, too. Then as I traveled up and down the east coast, I’d be more or less on the alert for them, and it would be more or less likely that I’d see one. :-) Here, we only have Turkey vultures. Our avian variety is lacking compared to most of the rest of the country! I love your photos of them! Loads of personality. They look great! I’d say you’re doing pretty well, species-wise. I wondered how Texas and Washington/Oregon would compare, and I found some figures (who knows how accurate, but they’ll do). Texas lists 647 species, Washington 514, and Oregon “over 500.” I’m sure many of yours are migratory, thanks to the Pacific flyway, but still — that’s a lot of birdies! I’d not looked closely at a map, and didn’t realize that my part of Texas is almost at the northernmost boundary of the black vultures’ range. That helps to explain why I never saw them growing up, or when living in northern states. I do think they’re quite spiffy. I don’t think I ever could become really fond of the turkey vultures, but these have a little more class. The statistics are interesting…I was thinking subjectively, and I bet there are quite a few Washington birds on that list that aren’t seen here in western Washington….it seems a bit drab to me, bird-wise, compared to metro New York, but maybe that has to do with seeing fewer individuals at a time, too, and not having a fabulous Spring migration of pretty warblers like the Atlantic coast does. There have been recent reports of snowy owls in Amarillo and Odessa, and a young one in Denison — the farthest south one’s been sighted this year. If I thought I could see a snowy owl, I’d head to Amarillo in winter — but part of the pain and part of the pleasure is that there never are any guarantees when it comes to nature. One of the neatest articles I ever read about birding in NYC concerned the monk parakeets that took up residence there. We have them, too, but it was something to see them in that northern snow! Very handsome birds, and you got a great catch light in their eyes also – what a bonus! I think they are handsome. I was pleased with the way their eyes caught the light; I’m glad you noticed. Even better, I caught one of them with the nititating membrane closed. I decided to save that one, and if I can find some photos of other birds with the membrane closed, I’ll do a single post about that phenomenon. It’s quite interesting. I had another of those strange experiences today. I mentioned a favorite song I hadn’t heard for years to someone last night, and this morning it was used as bumper music on a local radio station. There’s no explaining such things, so we might as well just enjoy them. Those twin habits of noticing and picking up help to keep curiosity alive, as well increasing our pleasure in the world. Show-and-tell always was a favorite part of school for me. I think many of us could argue, quite rightly, that our blogs are only a big person’s version of show-and-tell! Momento mori! Yes the more we look the more we see, can we see a possomhaw please? You certainly can. Here’s a photo of a possumhaw tree that was just down the road from the vultures. The scientific name is Ilex decidua — because it loses its leaves. The berries remain until the birds finally eat them all up. Our yaupon (Ilex vomitoria) looks much the same, except it keeps its leaves through the winter. You have some great shots. So documentary and descriptive. Yes, they tend to congregate in old trees unlike the turkey vultures, and closer to the ground. I like your analogy with Annie Dillard’s Pilgrim at Tinker Creek “a memento mori for people who read too much” “to find one on the pebbled bottom of a shallow stream”. Truly, I’ve developed a bit of fondness for these birds. Despite our gray, nasty weather, I went back down to the refuge on Sunday, and I swear it was this pair sitting on a branch a couple of trees down from where I found them the first time. One advantage of repeated visits is that I’ve been able to watch the development of some individual birds. One young great blue heron is always patrolling the same territory, and I’ve watched as his feathers and bill have changed — one he’s all grown up, I’ll show some of the changes.